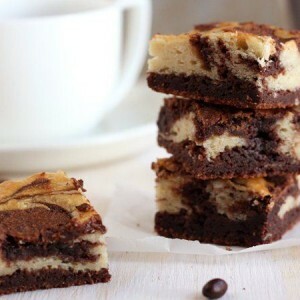 Blogger Annalise Sandberg of Completely Delicious bakes up brownies with a fun coffee-house twist. Heat oven to 350°F. Spray 8-inch square pan with cooking spray, or line with cooking parchment paper. In large bowl, mix 1/2 cup butter and 1 cup sugar. Add 2 eggs and the vanilla; stir until combined. Add 1 cup Bisquick mix, the baking cocoa and espresso powder. Stir until just combined; do not overmix. Add the chocolate chips. In medium bowl, beat cream cheese, 2 tablespoons butter and 1/4 cup sugar with electric mixer on medium speed until smooth and creamy, about 3 minutes. Add the egg, and mix until combined. Add 1/4 cup Bisquick mix in 2 additions, alternating with the brewed espresso. Spread half of the brownie batter into the pan. Use a spoon to drop dollops of filling over brownie batter. Drop remaining brownie batter by dollops on top of filling. Starting in one corner, drag knife through batter and filling. When you reach other side of pan, curve knife around without lifting it, and drag it back the other way, about 1 inch from your first line. Repeat with the rest of the pan, then turn pan and repeat for marbled design. Bake 25 to 35 minutes or until tops of brownies begin to turn golden and toothpick inserted in center comes out with moist crumbs. To remove air bubbles and produce a denser brownie, firmly tap the pan on the palm of your hand or counter several times before placing it in the oven. If you’d like an even stronger coffee flavor, increase the espresso powder to 3 tablespoons. Brownies will keep at room temperature for up to 3 days, but they also freeze very well. Tightly cover with plastic wrap, and store in freezer up to 2 months. Eat frozen, or thaw to room temperature.